A new experience is taking shape in Oregon’s wine country. 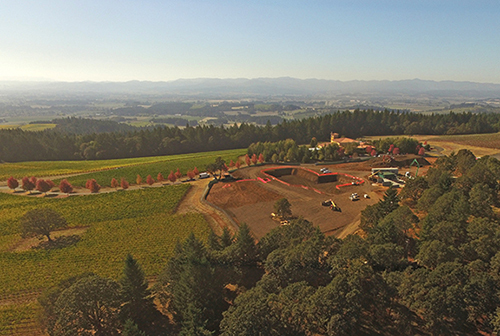 Nestled atop the Dundee Hills, Domaine Serene has begun construction on a new hospitality clubhouse that will transform this long-established winery. The Clubhouse at Domaine Serene will provide guests with a world-class winery experience. As the site planners and landscape architects, we are honored to assist owners Ken and Grace Evenstad in creating their legacy project. We are working closely with Waterleaf Architecture and Schommer & Sons Construction to position the new facilities within this dramatic landscape. Our design of the arrival sequence will create a sense of anticipation that culminates in a welcoming entry courtyard and a signature allee of Italian cypress trees. Terraces for wine tasting will wrap the clubhouse, offering spectacular panoramic views of the vineyards, the Dundee Hills, and the Cascade Mountains beyond. Domaine Serene’s owners greatly value the property’s native white oak savanna and the habitat that it provides. The expansion affords an opportunity to preserve and restore a large tract of oaks, which, combined with other sustainable elements we’ve designed, heightens the site’s ecological sustainability. This is an important model for the region’s winemaking story. The clubhouse will be complete in the summer of 2017. Until then, I am counting the days until I can sit on the terrace, take in the views, and enjoy a delicious glass of Evenstad Reserve pinot noir. 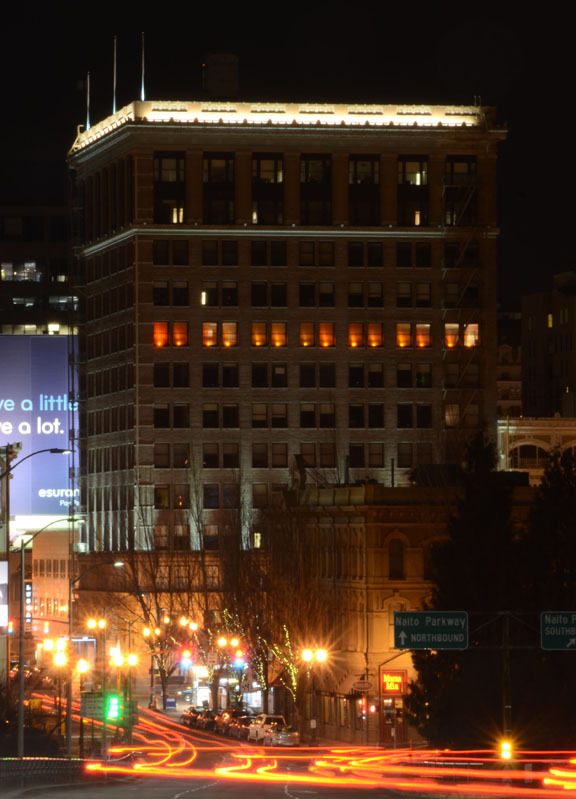 Mayer/Reed’s eighth floor studio glowed orange in celebration of Portland’s Winter Light Festival February 3-6, 2016. As a firm sponsor with steering committee members for this inaugural event, we were thrilled to see how the festival’s imaginative installations and activities brought the community out to light up these dark days of winter. We hope it’s the start of a new Portland tradition! Bicycle tourism is growing and generating “eye-opening” economic impact. Travel Oregon’s Bicycle Tourism Studio provides communities with planning and financial assistance to kick-start bicycle-based economic development. 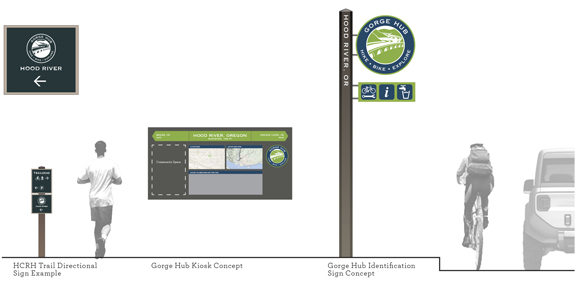 Mayer/Reed has been working with Travel Oregon to develop design strategies for bike and recreation-based place making, identity and wayfinding in places like Oakridge/West Fir, Mosier and Hood River. Recently we were commissioned to design a logo and style guide for the Gorge Hubs. These community-operated “rest stops” for hikers, bicyclists and recreationalists will provide support amenities while promoting exploration of local experiences. We dove deep to understand how to leverage the “hub” concept into a statewide program with coordinated marketing and signage applications. The logo creates an identity for welcome centers in 6 communities along the Historic Columbia River Highway and State Trail. The style guide addresses applications for signage, maps, print and digital media.